This is post number 23 in the series “30 Days of Tales from the Loop,” a celebration of the game set in an 80s that never was. 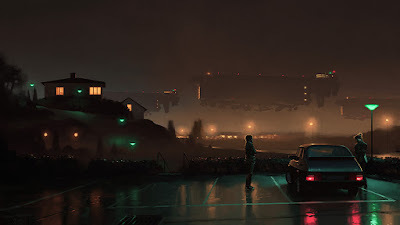 Although I can’t imagine anyone getting tired of the 80s Mälaröarna islands [or Boulder City] settings featured in Tales from the Loop, it might still be fun to imagine some other places and times and paradigms a gamemaster might use as a backdrop for the game. Indeed, one of the things coming in the future from Fria Ligan is a Things from the Flood expansion, which according to the TFTL RPG Kickstarter will shift the timeline from the 80s to the 90s and update the setting. I think that’s a great idea, and it would be my first choice of a second setting for the game. The first Loop was built in 1969, and it might be fun to play the first generation of Kids to experience the weirdness that naturally results. (For the DART Loop in the US, this would be the ‘50s.) The Kids might be likely to have parents who work at the Loop, and the facility would be so new it would be a natural place for a field trip. In the first few years of the Loop, security might be more (or less) tight, and high-tech accidents might be more common. More importantly, the Kids might be Flower Children! Shift the setting forward a few years if you want to feature hippies, bell bottoms, wide collars, and other 70s fun. Instead of Kids, the players might take the roles of adults—excuse me, “Adults”—who work at the Loop. They might be scientists, engineers, security guards, maintenance workers, or whatever else you can imagine. In fact, part of the Adults' job might be keeping out those meddling Kids! My first choice for this kind of campaign would cast the PCs as special agents tasked with investigating strange phenomena in the area, protecting the locals from unintentional dangers that manifest, and possibly even having to cover up connections to the Loop. Both of the original locations for Tales from the Loop are smaller towns, so it might be a worthwhile change of pace to set a Loop in a big city. Stockholm, New York, London, Paris, Moscow—each would have a different “Loop culture.” Also, big city Kids will have different lifestyles than their small-town or rural counterparts; their scenes of Everyday life will likely involve fewer friendly neighbors and more traffic and crime. But don’t worry—there will always be room for a Hick. The Loop has the potential to connect our world with alternate Earths (just ask Mr. Hansson [Miller]), possibly even an infinite number of them. The PCs could be involved in a mishap at the beginning of the campaign and spend the rest of it either trying to get back to their home universe or actively exploring other realities for fun. The Kids might have fun (or trauma) meeting alternate versions of their parents and friends and dealing with any variety of changes to reality. See the Rick and Morty animated series for ideas! Instead of sending the Kids to alternate Earths, it might send them into the past (or future). As with the Crisis on Infinite Loops campaign, this one could be about getting back home or the focus could be on exploring a series of different time periods. Imagine the Kids trying to fit in while in a Wild West setting, or the Trouble they could get into on commandeered hoverboards in the future. Finally, what if the player characters aren’t even humans at all? They might be creatures spawned from the Loop in some way, such as extradimensional beings, artificial life forms, self-aware robots, alien visitors, clones, you name it. And their goals could be just as varied, from the humble (trying to get back home or live in peace in this strange new world) to the grandiose (spread their kind all over the world). Have another campaign idea you think would be fun? Share it in the comments!